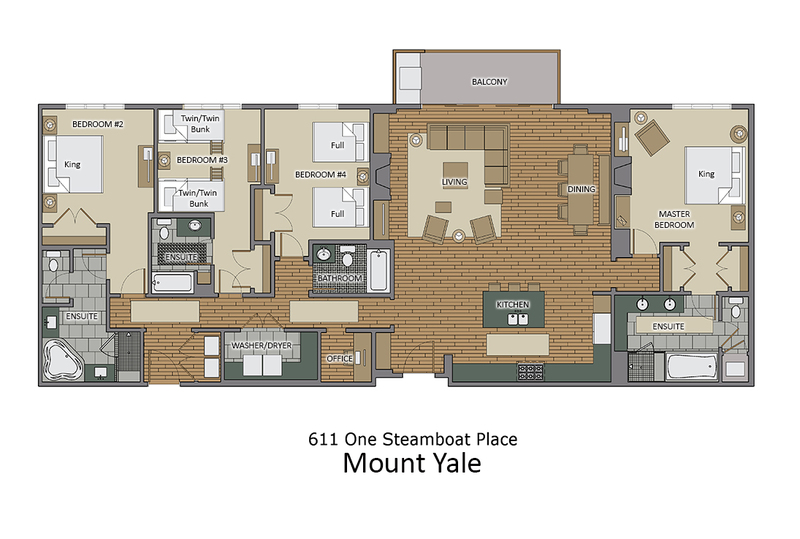 The Mount Yale Residence overlooks the central plaza of the Steamboat mountain village. This private, luxury residence exudes contemporary elegance and is crafted with meticulous attention to detail. Guests enjoy ultimate ski-in, ski-out access being located just steps from the Steamboat Gondola. The Mount Yale Residence features a large living area overlooking the central plaza and its open floor plan connects the living and dining areas to the kitchen with plenty of room for the entire group to gather. A professionally equipped kitchen complete with Viking appliances will inspire and delight the chefs in your group. You can also grill year-round in the great outdoors at the built-in Viking gas grill on the deck. All One Steamboat Place residences feature luxurious furnishings and décor throughout the home. Each master bedroom offers a gas fireplace and the main master bath features a steam shower and Jacuzzi tub, double vanities and a separate WC. The third bedroom in this residence offers a queen bed and the fourth has two Full beds. The home office nook boasts an iMac home computer and high speed Wi-Fi throughout allowing Internet service for all guests. A printer is available at the front desk and guests can also videoconference with the front desk from the home office.